K: Holy cow! I can’t believe it! E got her fingers in her mouth! Yesterday she didn’t even seem to know she had hands! She’s so amazing! Other Parent: Yeah, my kid’s been doing that for a while. K: Oh my gosh! I thought I saw that last week. Your kid’s so amazing! I have to admit that after 6 years and 2 babies, some of the shine has worn off. I recently read in Some Internet Article (if you know which one, please speak up and I’ll quote it directly…I like to give credit where it’s due) that one of the things that’s hard for me is that I spend a lot of time getting things “back to zero”. This is kind of true. According to the article, my work includes things like making zero dishes in the sink, zero toys on the floor, zero loads of laundry left to put away (hah! ), etc. This is often true. What is NOT true, and I have to keep reminding myself of this, is that the ‘back to zero’ thing does not apply to my children. If I slip into thinking that it does which is very, very easy (because zero diapers to change, zero naps to conquer, zero snacks to give, zero boogers to wipe), then I will miss the incremental progress that they are making. You know, the stuff that used to allow me to hold on through another screaming fit about having the wrong diaper on (even though the right diaper is dirty). If I stand in my back yard in April and look, I’ll notice the beautiful fence we put in last year, the swingset, and the beginnings of E’s fruit garden. A little closer and I’ll see mud puddles, toys strewn about the yard, and the weeds around the strawberry patch. But a little closer still, and it gets fun again. I can look close enough to see a ladybug walking on a stick. Or the new growth in my herb garden. I think, parenting-wise, I’m kind of looking at the mud puddles right now. It’s time to focus a little more on the prodigiously ordinary things. Today E easily sounded out a word that she couldn’t read at all last week. Today S only had to be told to climb down off the couch 5 times instead of 50 like yesterday. Today we went on a bear hunt. We were going to catch a Big Bear. Who us? We’re not scared. Today E got her own snack out of the fridge and I didn’t have to do it. Today S was SUPER ANGRY that I didn’t give him an apple. He was so upset that he composed a song about it. We sat at the piano and played with our fingers and sang a Very Sad Song (well, as sad as you can be in C Major–I’m not good at improvising). All that’s to say, these are not the sorts of things that will get them into college someday. But they are things that happened, that would not have happened yesterday. While they may seem small by some estimations, to me they are the difference between Zero and Not Zero. Discipline. Love. Respect. Boundaries. Flexibility. Discipline. Relationship. Authority. Attachment. There are so many different words to describe the way we relate to our children. I feel strongly that it is important for E. to grow up understanding how to relate to other people in appropriate ways. For that to happen, she needs to know now that I am the parent and she is the child. 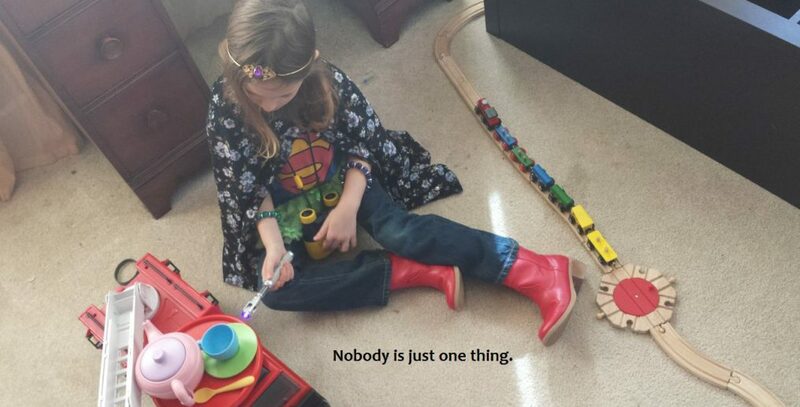 This first experience with authority will shape the way she reacts when she is in school, the work force, friendships…it will color the way she views the world. Experiencing consistent, loving and reasonable authority early on could give her some tools to form healthy relationships for her whole life. The way we think and feel about God is also informed by the way our parents relate to us. The way I was parented led me to think of God as patient, loving and gentle. Not because my parents said that God was those things (they probably did at some point but I don’t remember that), but because in those formative years they modeled those traits for me. If there is a God who created me, he is in some sense a Father and it made sense to me that he would be like my dad who was so kind or my mom who was so thoughtful. I want that for my children. We have been adjusting to a new level of communicativeness with E. It is especially hard for J. who was on ‘Daddy duty’ most of the weekend while I finished up a painting project (okay, I primed the upstairs trim almost 2 years ago and finally decided to put the color on). When someone is a baby, they need everything done for them. They also don’t argue so much about being put somewhere else. As that person gets more and more aware, however, they start to have opinions about things. It has become our pattern to tell her what needs to happen and then ask her if she wants to do it, or if we should do it for her. This is working well for shoes, getting into the carseat, going inside, etc. etc. Hmm….correction…was working. The tension that we sometimes deal with right now is between when to give her space to explore her world and when to put our foot down. It’s true that we should not have to tell her 16 times to please come back to the back yard because we are not able to watch her in the front at a given moment. Maybe instead we could abandon our back-yard project for 2 minutes to smell the lavender, or maybe not. We have to make each decision in the moment and we do it imperfectly. I think in the end it comes down to being as flexible as possible, and not giving a direct order unless we are prepared to insist that it be followed. Yes, my girl. I will stay. Please always ask me to stay. E. is having a difficult week. If I didn’t know better, and if she wasn’t 2, I would think she was about to start her period. She cries over big things. She cries over things that seem small to me, but must be huge to her. She gets inconsolably angry if I give her juice but don’t give it to her in a big-girl glass. She is so bright and fun almost all of the time, and I love interacting with her because she is such a people person. This is a tough bit, but it will pass and she won’t always get so frustrated about her glass of juice. My role right now is to try to help her to move through it with as much grace as possible. This afternoon when I got her home, we began the trial and error. 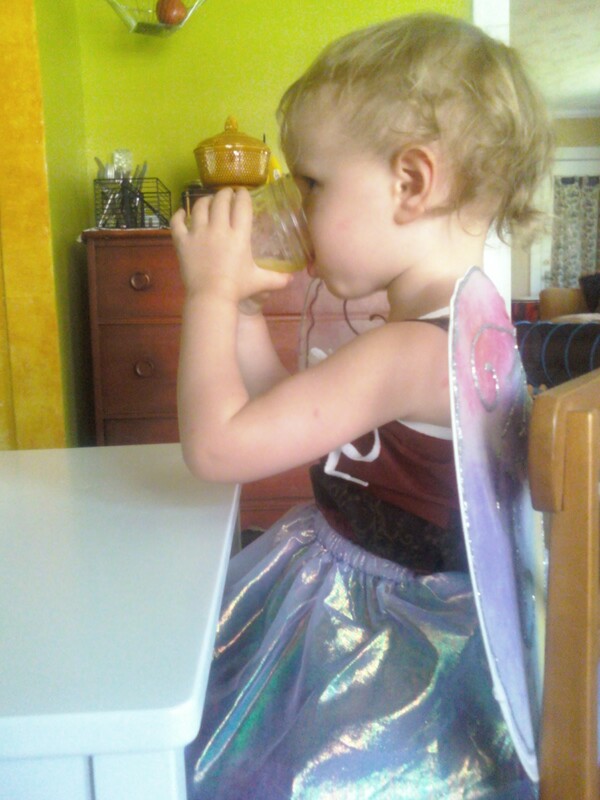 Eventually sitting at the table she wanted, in the chair she wanted, with the right juice (diluted with the right amount of water), in the right glass, E. was still very distressed. So I said to her, “Would this moment be better if you could dress up like a fairy princess?” She thought about it for a minute, and said very quietly, “Yes, Mommy. I wear that.” And you know what? It was better. We sat for a while and chatted while she drank orange juice and enjoyed feeling different. Sometimes (though certainly not always), I think that the key to moving forward through overwhelming bad feelings in a given situation can be simply having the imagination to think about yourself behaving differently.